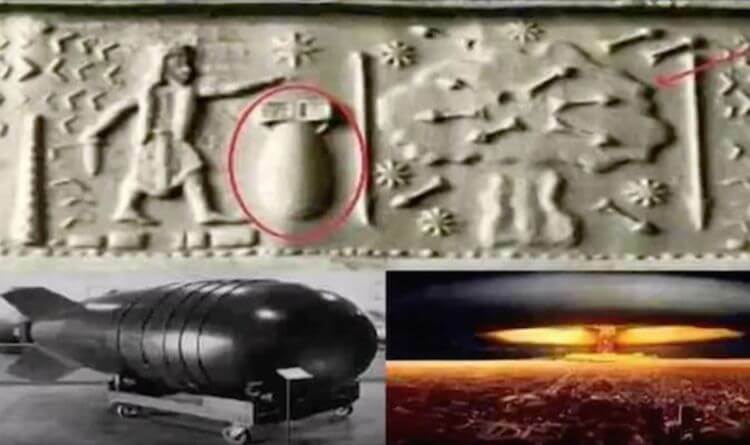 A NUCLEAR bomb blast killed half a million people in India 12,000 years ago, according to shocking claims being made. Videos uploaded by conspiracy theory and UFO websites suggest there is evidence of the ancient blast happening in a desert region near Jodhpur. Website ufosightingsdaily.com was the latest to link to one of the videos today. The “evidence” is alleged to be based on “writings” in ancient texts and an area where high levels of radiation were allegedly detected. The theory is based on alleged passages from the Mahabharata and the Ramayana, Sanskrit epics said to be written in around the 8th or 9th century BC, about the Kurukshetra War and battle between Rama and the demon Ravana respectively. The website points to these allegedly translated extracts from the texts: “A single projectile charged with all the power in the Universe…An incandescent column of smoke and flame as bright as 10,000 suns, rose in all its splendor…it was an unknown weapon, an iron thunderbolt, a gigantic messenger of death which reduced to ashes an entire race. “The corpses were so burned as to be unrecognisable. Their hair and nails fell out, pottery broke without any apparent cause, and the birds turned white. The theory suggests the discovery of an area of high radiation in the 1990s and several corpses found in an ancient city back up the texts. It suggests that nearby several skeletons were unearthered in an ancient city whiuch appeared to have perished together in the streets. The theory claims there is evidence of a nuclear blast crater – the Lonar Crater near Mumbai, which cannot be explained. Conspiracy theorists have claimed time travellers or aliens could be explanations for how advanced technology developed in the 20th century was available 12,000 years ago. But, despite appearing on many conspiracy theory and UFO websites, the story has been exposed as “fake news”. Debunking website skeptoid.com investigated the claims. It found no evidence of the reported passages in translated versions of the texts. It also found no evidence outside of conspiracy forums to suggest the area of high radiation had been discovered in the desert. The images of the ancient city and skeletons used with the reports were found to have actually been taken at the ancient cities of Mohenjo-Daro and Harappa, which are around 300 miles away from the alleged site. Skeptoid.com said: ” If this was a nuclear war, it was practically a nationwide theatre. “Mohenjo-Daro and Harappa are both about 500 km from Jodhpur, one to the north and one to the west. None of these places are anywhere near each other. “Sadly for the legend, there is nothing remotely like this story in any archaeological publications. Skeptoid.com said the Lonar Crater was 470 miles from the alleged site and had been dated back to being formed 52,000 years ago, long before the alleged ancient bomb blast.